"Aquatherm doesn’t radiate heat the way black pipe does. The Btus are actually going where you want them to." When a pig barn is occupied and operating the indoor air quality can be very harsh, but Aquatherm pipe is unaffected by the corrosive environment. A happy sow is a better sow. If you didn’t know that, don’t worry: the people who need to know it do. They also know that Aquatherm polypropylene-random (PP-R) pipe can help make sows and humans alike very happy. Those who are unfamiliar with hog farming may never stop to think where that bacon is coming from. But it is a major business in some areas, and the indoor environment in a hog barn can be harsh. The ammonia and other chemicals (both man-made and hog-made) in the air can quickly attack and corrode metal pipe. That makes Aquatherm PP-R pipe an ideal choice for these applications. 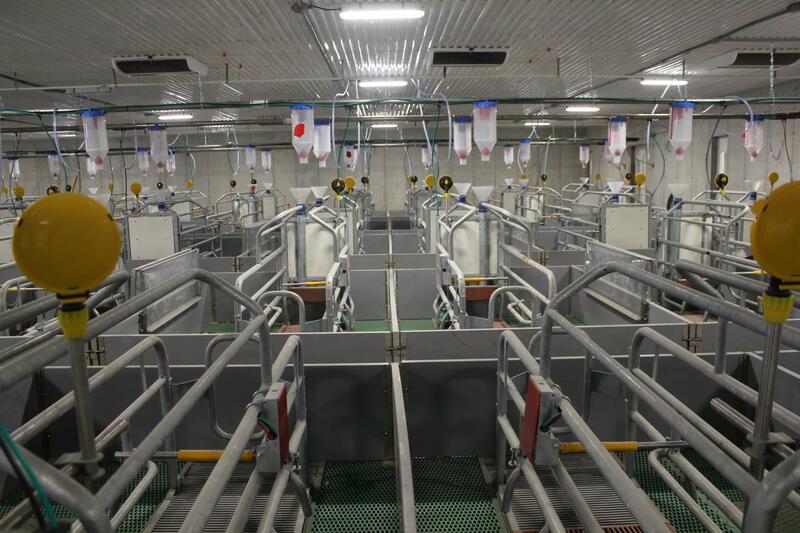 At the Boekhorst Farm in Arkona, Ontario, Mid-Lam Heating & Cooling ran more than 1,500 ft of Aquatherm Blue Pipe® for a heating and cooling system moving 1.2 million Btus in a 64,000 sq ft pig barn. In addition to the space heating and cooling, the system also feeds individual heating pads for the sows. After all, we did mention that a happy sow is a better sow. The contractor on this project was impressed that Aquatherm pipe doesn’t radiate heat the way black pipe does. Mid-Lam Heating & Cooling is a 30-year-old residential and agricultural contracting firm named for its location on the border of Middlesex and Lambton counties in southeastern Ontario. Owner Kent McLellan and his team had experience with Aquatherm PP-R pipe on previous projects, and he knew immediately that it would be the right choice for this pig farm. In fact, he said he never would have considered another option. The system design for this project was performed by Brendon Yadu, Technical Sales at Hydronic Solutions Inc., Waterloo, Ontario. The design called for 120 13-ft lengths of Aquatherm Blue Pipe SDR 11, 2½-in. at the headers and 4-in. in the mechanical room and the barn itself. Other key components of the system included five 399,000 Btu Triangle Tube condensing boilers, a Caleffi low-loss header and mixing valves, and pumps from Wilo. The Aquatherm piping installation took place over three months in the autumn of 2017. The process went smoothly, with Ritmo fusion tools and support from Hydronic Solutions. The system was not complicated, but it was extensive. A large hot water (180°F) circulation loop runs the length of the barn. This loop is split by system pumps to go into the barn’s two wings, and from there additional pumps and mixing valves allow the water temperature to be modulated for various purposes. “For example, the sows in what are called the farrowing rooms have hydronic heating pads that slowly raise and lower them when they stand up and lie back down. That helps ensure that little piggys don’t get trapped underneath the heavy sow,” Yadu explained. He added that Mid-Lam’s success with Aquatherm on similar projects contributed to the company’s confidence using it at this pig barn. “Kent has been working with us for a number of years as he has been growing his business,” Yadu said. “He started using Aquatherm a number of years ago and really liked the product. Mid-Lam does a lot of agricultural work and Aquatherm pipe fit perfectly in these applications. Compared to some of the other residential and agricultural projects Mid-Lam has successfully completed in its long history, the size of this project might have been considered daunting. However, McLellan said the ability to break the project down by zones enabled his team to handle it without being overwhelmed. The fabrication capabilities of the Mid-Lam team and the versatility of Aquatherm pipe helped keep this project moving, as assemblies could be prepped in advance or custom fit on the spot. McLellan noted that his people like working with Aquatherm PP-R pipe more than steel or black iron, because of its lighter weight and ease of joining pipes via heat fusion compared to welding. He advised companies just discovering the advantages of heat-fused PP-R pipe to train anyone who has the interest and potential. 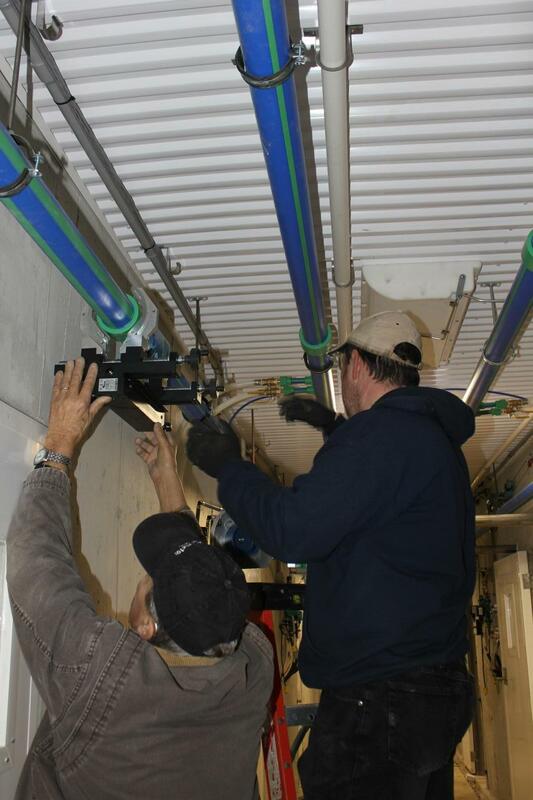 Technicians from Mid-Lam Heating & Cooling heat-fusing Aquatherm pipe. 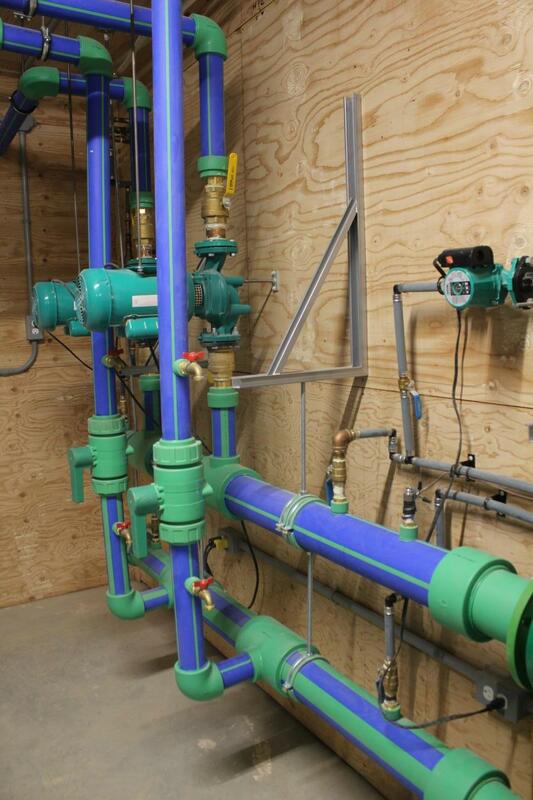 According to McLellan, several factors were important when it came to the choice of Aquatherm pipe for this pig barn. The biggest factors were resistance to environmental chemicals and the installed pipe’s ease of maintenance, but also key was that Aquatherm pipe gives off so little heat. Also important were environmental friendliness, and the fact that no open flames, solder, or ‘pipe dope’ are needed. “You can’t beat it,” McLellan said. Yadu agreed that Aquatherm’s resistance to harsh environments is a big advantage when it comes to agricultural applications. In addition to holding up well in the corrosive indoor environment of a pig barn, Aquatherm pipe is cleaner and easier to maintain than steel pipe, Yadu said. Yadu noted that some pictures of this project posted on LinkedIn generated a tremendous number of views.